2 or more: $88.34 ea. Stop paying extra for pre-sliced food. 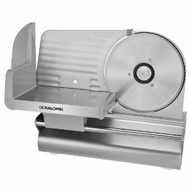 Slice your own meat, cheese, bread, vegetables and fruit quickly and easily with this quality slicer. Features precision depth control and a strong, high quality 200 watt gear motor. Variable thickness control dial from 0 “safe mode” when unit is put away, deli-thin 1/32-inch to 1/2-inch thick. Large multipurpose 7-1/2-inch serrated stainless steel blade handles a wide range of food sizes and shapes.